What Happens With a Normal Sinus Rhythm? Your heart's job is to pump blood to your body. When it's working the way it should, it pumps to a regular, steady beat. This is called a normal sinus rhythm. When it's not, you could have an irregular heartbeat called AFib. You probably don't think much about your heartbeat because it happens so easily. It's really like a complex dance. During each beat, the two upper chambers of your heart squeeze, or contract. Those are the atria. Then the two lower chambers, called the ventricles, contract. When the chambers contract, they move the blood along. Your heart's electrical system controls the timing of the pumps. Each heartbeat starts with a signal from the sinoatrial (SA) node, in your right atrium. The SA node is called the heart's pacemaker because it adjusts your heart rate based on what you're doing. It raises your heart rate (the same thing as your pulse) when you exercise and slows it down when you sleep. The signal spreads across the right and left atria. That makes them contract and forces blood into your ventricles. Then, the signal moves to the atrioventricular node (AV) node, which is near the middle of your heart. From there, the signal travels through the ventricle walls. That makes them contract and squeeze blood out of the heart. The right ventricle sends blood to your lungs, while the left pumps it to the rest of your body. The walls then relax and wait for the next signal. When everything is working smoothly, you have a normal sinus rhythm and your heart beats between 60 and 100 times per minute. Sometimes the heart's electrical system doesn't work the way it should. Atrial fibrillation, also called AF or AFib, is the most common type of irregular heartbeat. In this case, the signals get jumbled. As a result, instead of beating strongly and regularly, the atria quiver. So blood doesn't move into the ventricles very well. Instead of the dance being nice and organized, things are hectic and confusing. Many signals -- sometimes as many as 600 -- leave the atria at the same time, competing to get through the AV node to the ventricles. However, the AV node prevents them all from getting through. Only about one or two out of every three beats pass through. They go quickly and messily, resulting in an irregular heartbeat. The heart rate during AFib is often between 100 and 175 beats per minute. Some people have AFib every once in a while. Symptoms might last for a few minutes or a few hours. Then things return to normal. Other people have AFib often and need treatment to get their heartbeat to return to a normal sinus rhythm. Go to the ER if you have symptoms. AFib won’t cause a heart attack in a healthy heart, but it does raise your odds of having a stroke. And timely treatment, usually with a medication called a blood thinner (your doctor may call it an anticoagulant), can prevent strokes. 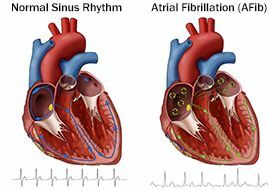 Mayo Clinic: “Atrial Fibrillation Won’t Cause Heart Attack but Can Lead to Other Serious Complications,” "Atrial fibrillation - Symptoms and Causes." American Heart Association: “High Blood Pressure, AFib and Your Risk of Stroke,” “Treatment Guidelines of Atrial Fibrillation (AFib or AF),” "What is Atrial Fibrillation (AFib or AF)?" "What are the Symptoms of Atrial Fibrillation?" National Heart, Lung, and Blood Institute: "Heart Contraction and Blood Flow," "Your Heart's Electrical System." KidsHealth.org: "Your Heart and Circulatory System." UptoDate: "Normal sinus rhythm and sinus arrhythmia."